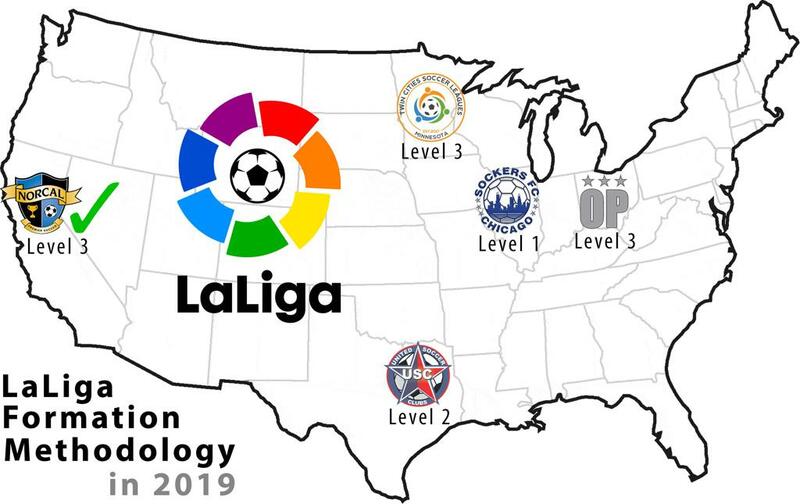 US Club Soccer and LaLiga are presenting four LaLiga Formation Methodology coaching education courses this summer, hosted by member clubs and leagues throughout the country. The courses cover every level of the series: Level 3 (introductory), Level 2 (advanced) and the first-ever Level 1 (expert). Through 14 courses, about 1,500 coaches from more than 400 clubs and organizations have been educated in LaLiga Formation Methodology. The most recent course was a Level 3 in California, hosted in January by NorCal Premier. These courses help coaches form a methodological foundation that they can implement in their clubs. The methodological principles have been developed in Spanish academies to train some of the world’s best players. Headlining this summer’s lineup is the first Level 1-U.S. course in suburban Chicago, Aug. 2-4, hosted by Sockers FC Chicago. To date, there have been 11 Level 3 courses and three Level 2. The Level 1-U.S. course is the penultimate progression in the series. Coaches who complete a Level 1-U.S. course will be eligible to attend a Level 1-Spain course upon completion of additional course work. The first Level 1-Spain course is tentatively scheduled for February 2020. All four hosting organizations have demonstrated commitments to Players First and, in particular, to the Coaching Development pillar. The United Soccer Clubs hosted the first-ever LaLiga Formation Methodology course in 2016, as well as a second Level 3 course last year. Ohio Premier SC has excelled at the highest level of US Club Soccer programming, having won a 19-U ENPL national championship last season and been granted Players First licensing. Sockers FC Chicago was also among the first group of Players First-licensed clubs and has previously hosted two LaLiga Formation Methodology courses: a Level 3 in 2016 and a Level 2 last year. Rounding out the quartet, the Twin Cities Soccer Leagues has recently hosted U.S. Soccer grassroots courses via US Club Soccer. One of the Minnesota-based leagues’ members is Blaine Soccer Club, which is a Players First-licensed club. LaLiga Formation Methodology courses outline the philosophy and methods used across LaLiga to train, develop and form some of the world’s top players. The 2½-day courses includes theory and practical sessions both on and off the field. Coaches must complete the previous level course before advancing to the next. Understand the training sessions structure following the different principles of progressivity, cohesion and pertinence. Understand the coach role in the team’s management, setting different kinds of leadership models. Understand the collective nature of football from a holistic perspective where all the performance (physical, technical, tactical and psychological) factors take place at the same time. Develop during the workshops and sessions, under the supervision and feedback of LaLiga experts, different training sessions and exercises according with each objectives and context. Know the particularities of the initiation stages in terms of players development, know the contents proposed by LaLiga for this stage. Know the prosed competition structures by LaLiga for the different development stages. Understand the principles of system and strategy training from a practical session led by LaLiga experts. Know and understand the different players needs and requirements per position and game model. Individualize the training regarding the players specificity and demands. To set different exercises to work specifically by lines and positions. To apply the different principles of the game model to the football training to fit as much as possible our intervention to the reality of the game. To know the different fundamentals and characteristics of the development stage and their application through LaLiga methodology. To introduce the goalkeeper role and training fundamentals. To know different technologies applied to soccer from different perspectives and roles: coach, scouting, game analyzing. To set a coherent programming in short and medium term adapted to their own reality and players characteristics. Registration details for all four courses are available on the Players First courses/events web page. Each course’s dedicated web page contains further information, including: detailed schedules, discounted hotel rooms, venue logistics, bios of LaLiga leadership, etc.